Listen to ANGEL-HO and LAO’s edits now. EMBACI is an 18-year-old singer-songwriter from Brooklyn with a voice that ripples like silk. Earlier this summer, she spent time at N.Y.C's Red Bull Studios with the brilliant minds behind African diaspora artist collective NON Records and Mexico City's N.A.A.F.I crew, and the results will be released as a joint NON VS. NAAFI digital tape this August. Production credits will include ANGEL-HO, Chino Amobi, Mhysa, Nkisi, Elysia Crampton, LAO, zutzut, and IMAABS, which sounds like one heck of a studio party. For now, though, you can listen to EMBACI's collaborations with ANGEL-HO (who contrasts her silky vocals with serrated synths) and LAO (who adds a sparse yet sultry bounce). The lyrics for both were improvised over the beat in the studio, EMBACI told The FADER. "While singing I was trying to channel a girl who is a warrior and declaring her worth," she said. "In each remix there is an essence of that in the song, and I love it. I have so much respect and admiration for all the collaborators on this project." 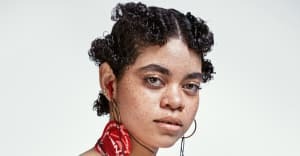 ANGEL-HO told The FADER the feeling is mutual: "When I first met Embaci we were in New York Red Bull Studios. I walked in, sat down, and was like, omg who is singing? Everyone was mesmerized by her voice so they pointed to the booth and there she was freestyling. The way I imagined our track was as a conversation. As if I were on the phone with her and responding. When she sings, she inspires colors and patterns; that she bought out in me. This is prolly my favorite collaboration ever." "Meeting friends and new people IRL is amazing," LAO added. "I've never got the chance to work with a singer like Embaci before, so it was a great experience. Exchanging ideas through work is the best way to have a meaningful dialogue."